Departure Airport From Boston (BOS) Chicago (ORD) Dallas (DFW) Fort Lauderdale (FLL) Houston (IAH) Los Angeles (LAX) New York (JFK) Newark (New York) (EWR) Orlando (MCO) San Francisco (SFO) Seattle (SEA) Washington Dulles (IAD) --------------- Abidjan (ABJ) Abuja (ABV) Accra (ACC) Addis Ababa (ADD) Adelaide (ADL) Ahmedabad (AMD) Algiers (ALG) Amman (AMM) Amsterdam (AMS) Athens (ATH) Auckland (AKL) Baghdad (BGW) Bahrain (BAH) Bali (DPS) Bangkok (BKK) Barcelona (BCN) Basra (BSR) Beijing (PEK) Beirut (BEY) Bengaluru (BLR) Birmingham (BHX) Bologna (BLQ) Brisbane (BNE) Brussels (BRU) Budapest (BUD) Buenos Aires (EZE) Cairo (CAI) Cape Town (CPT) Casablanca (CMN) Cebu (CEB) Chennai (MAA) Christchurch (CHC) Clark (CRK) Colombo (CMB) Conakry (CKY) Copenhagen (CPH) Dakar Blaise Diagne Airport (DSS) Dammam (DMM) Dar Es Salaam (DAR) Delhi (DEL) Dhaka (DAC) Dubai (DXB) Dublin (DUB) Durban (DUR) Düsseldorf (DUS) Edinburgh (EDI) Entebbe (EBB) Frankfurt (FRA) Geneva (GVA) Glasgow (GLA) Guangzhou (CAN) Hamburg (HAM) Hanoi (HAN) Harare (HRE) Ho Chi Minh City (SGN) Hong Kong (HKG) Hyderabad (HYD) Islamabad (ISB) Istanbul Airport (IST) Istanbul Sabiha Gokcen International Airport (SAW) Jakarta (CGK) Jeddah (JED) Johannesburg (JNB) Kabul (KBL) Karachi (KHI) Khartoum (KRT) Kochi (COK) Kolkata (CCU) Kuala Lumpur (KUL) Kuwait (KWI) Lagos (LOS) Lahore (LHE) Larnaca (LCA) Lisbon (LIS) London Gatwick (LGW) London Heathrow (LHR) London Stansted (STN) Luanda (LAD) Lusaka (LUN) Lyon (LYS) Madrid (MAD) Malé (MLE) Malta (MLA) Manchester (MAN) Manila (MNL) Mauritius (MRU) Medina (Madinah) (MED) Melbourne (MEL) Milan (MXP) Moscow (DME) Mumbai (BOM) Munich (MUC) Muscat (MCT) Nairobi (NBO) Newcastle (NCL) Nice (NCE) Osaka (KIX) Oslo (OSL) Paris (CDG) Perth (PER) Peshawar (PEW) Phnom Penh (PNH) Phuket (HKT) Porto (OPO) Prague (PRG) Rio de Janeiro (GIG) Riyadh (RUH) Rome (FCO) Santiago de Chile (SCL) São Paulo (GRU) Seoul (ICN) Seychelles (SEZ) Shanghai (PVG) Sialkot (SKT) Singapore (SIN) St. Petersburg (LED) Stockholm (ARN) Sydney (SYD) Taipei (TPE) Tehran (IKA) Thiruvananthapuram (TRV) Tokyo Haneda (HND) Tokyo Narita (NRT) Toronto (YYZ) Tunis (TUN) Venice (VCE) Vienna (VIE) Warsaw (WAW) Yangon (RGN) Zagreb (ZAG) Zürich (ZRH) Press space or enter to clear Departure Airport. Arrival Airport To Boston (BOS) Chicago (ORD) Dallas (DFW) Fort Lauderdale (FLL) Houston (IAH) Los Angeles (LAX) New York (JFK) Newark (New York) (EWR) Orlando (MCO) San Francisco (SFO) Seattle (SEA) Washington Dulles (IAD) --------------- Abidjan (ABJ) Abuja (ABV) Accra (ACC) Addis Ababa (ADD) Adelaide (ADL) Ahmedabad (AMD) Algiers (ALG) Amman (AMM) Amsterdam (AMS) Athens (ATH) Auckland (AKL) Baghdad (BGW) Bahrain (BAH) Bali (DPS) Bangkok (BKK) Barcelona (BCN) Basra (BSR) Beijing (PEK) Beirut (BEY) Bengaluru (BLR) Birmingham (BHX) Bologna (BLQ) Brisbane (BNE) Brussels (BRU) Budapest (BUD) Buenos Aires (EZE) Cairo (CAI) Cape Town (CPT) Casablanca (CMN) Cebu (CEB) Chennai (MAA) Christchurch (CHC) Clark (CRK) Colombo (CMB) Conakry (CKY) Copenhagen (CPH) Dakar Blaise Diagne Airport (DSS) Dammam (DMM) Dar Es Salaam (DAR) Delhi (DEL) Dhaka (DAC) Dubai (DXB) Dublin (DUB) Durban (DUR) Düsseldorf (DUS) Edinburgh (EDI) Entebbe (EBB) Frankfurt (FRA) Geneva (GVA) Glasgow (GLA) Guangzhou (CAN) Hamburg (HAM) Hanoi (HAN) Harare (HRE) Ho Chi Minh City (SGN) Hong Kong (HKG) Hyderabad (HYD) Islamabad (ISB) Istanbul Airport (IST) Istanbul Sabiha Gokcen International Airport (SAW) Jakarta (CGK) Jeddah (JED) Johannesburg (JNB) Kabul (KBL) Karachi (KHI) Khartoum (KRT) Kochi (COK) Kolkata (CCU) Kuala Lumpur (KUL) Kuwait (KWI) Lagos (LOS) Lahore (LHE) Larnaca (LCA) Lisbon (LIS) London Gatwick (LGW) London Heathrow (LHR) London Stansted (STN) Luanda (LAD) Lusaka (LUN) Lyon (LYS) Madrid (MAD) Malé (MLE) Malta (MLA) Manchester (MAN) Manila (MNL) Mauritius (MRU) Medina (Madinah) (MED) Melbourne (MEL) Milan (MXP) Moscow (DME) Mumbai (BOM) Munich (MUC) Muscat (MCT) Nairobi (NBO) Newcastle (NCL) Nice (NCE) Osaka (KIX) Oslo (OSL) Paris (CDG) Perth (PER) Peshawar (PEW) Phnom Penh (PNH) Phuket (HKT) Porto (OPO) Prague (PRG) Rio de Janeiro (GIG) Riyadh (RUH) Rome (FCO) Santiago de Chile (SCL) São Paulo (GRU) Seoul (ICN) Seychelles (SEZ) Shanghai (PVG) Sialkot (SKT) Singapore (SIN) St. Petersburg (LED) Stockholm (ARN) Sydney (SYD) Taipei (TPE) Tehran (IKA) Thiruvananthapuram (TRV) Tokyo Haneda (HND) Tokyo Narita (NRT) Toronto (YYZ) Tunis (TUN) Venice (VCE) Vienna (VIE) Warsaw (WAW) Yangon (RGN) Zagreb (ZAG) Zürich (ZRH) Press space or enter to clear Arrival Airport. Unfortunately, we can’t provide information about services on flights with our partner, Qantas. Please visit qantas.com for more information. Unfortunately, we can’t provide information about services on flights operated by other airlines. Please visit the airline's website for more information. Unfortunately, we can’t provide information about the services on trains. Unfortunately, we can’t provide information about the services on buses. Aww . . . this is so fluffy. 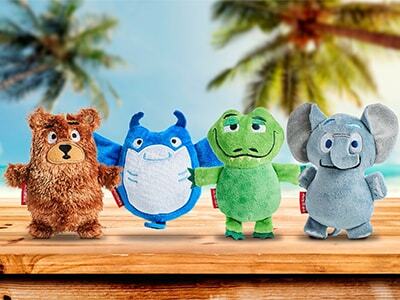 Little adventurers can share their journey with furry friends from around the world. Brett the bear, Mia the manta ray, ChaoChao the alligator, and Savannah the elephant have joined our growing Fly With Me Animals family on board. You can pick up the older members of the gang at the Emirates Official Store (opens an external website in a new tab) to complete your young explorer’s collection. Children can wrap up in a blanket with their new buddy, use it as a bag, or attach a cuddly companion to their stroller when they’re on the move. And they can also explore our Fly With Me Animals magazine, which is full of puzzles, games and comes with colored pencils. It’s theirs to enjoy on the flight and take with them when they land. Families come first with our services for young flyers. In our airport lounges, you can use our mother and baby room to change and feed your little adventurer, and children can enjoy video games in our play areas. Young flyers between 2 and 12 years old will love our range of children’s favorites. They’ll also get a snack box filled with treats to enjoy along the way. If your child has a special diet, tell us when you book and we’ll serve a meal that’s right for him or her. Boredom is banished on our flights with nonstop children’s entertainment. 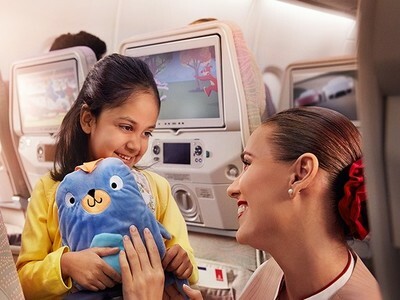 Watch faces sport toothy grins with our dedicated children’s inflight entertainment. Kids can pop on their brightly colored headphones and choose from a huge collection of Disney favorites, the latest kids' TV shows, and popular cartoons that feed their imagination. 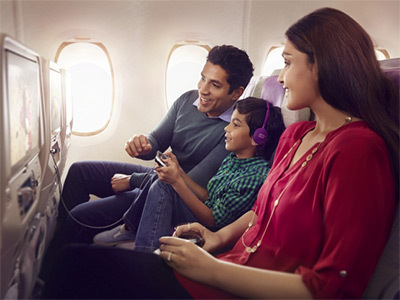 They can also challenge themselves or their friends to any of more than 100 exciting inflight games on our award-winning entertainment system, ice. Capture special moments with our onboard camera. Ask our crew to snap your picture, and take home a framed photo of your adventures together. Get rewarded for surfing the skies. Young adventurers earn Skywards Miles as they fly. Spend them on great rewards, like free flights, Apple iPods, and free trips to Wild Wadi Water Park in Dubai. 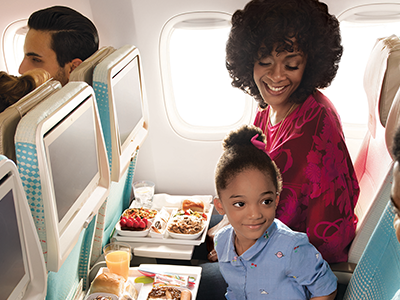 We’ll also give Skysurfers extra special treatment—if your child likes the window seat, being a Skysurfer helps get him or her one. It’s easy and free to join.